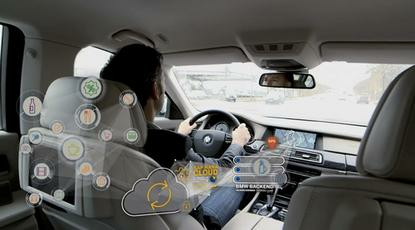 SAP and BMW are working on a system that connects drivers with real-time offers and services. BMW refuses to yield to tech and advertising firms that are eyeing up the carmaker's connected car data, it revealed during the Detroit Motor Show. Speaking at the North American International Auto Show, BMW'S sales and marketing lead, Ian Robertson told The Financial Times that the carmaker is taking the issue of wireless connectivity in cars and data privacy extremely seriously. "There's plenty of people out there saying: 'Give us all the data you've got and we can tell you what we can do with it'". Aside from location and speed information collected by telematics, Robertson added that carmakers like BMW could tell whether a child is sitting in the car through weight sensors in the seats. BMW were the first carmaker to offer factory-fitted telematics into their models so customers could benefit from usage-based insurance. The issues surrounding data privacy for drivers will continue to be a hot topic alongside security and legal issues as cars become more connected and, eventually, more autonomous. Telephone companies, as well as insurers, are investing in telematics to offer customer's better rates in exchange for monitoring their driving. These companies could use this information to sell to third parties, like local authorities, to improve town planning, Telefonica told ComputerworldUK last year. Further, there is an opportunity for restaurants and shops to offer location-based push notifications when a car drives past certain chains - enticing the driver to stop. Connected and driverless cars were the hot topic at the annual consumer tech show, CES, last week, where Ford's chief technology officer claimed driverless cars would be available to buy within five years.